Continuous monitoring of your key applications is imperative to eliminate prolonged delays in the delivery of the business-critical services and to minimize service downtimes. However, not all issues in service performance can be attributed strictly to the applications. Most often, errors at the operating system-level can ripple and affect the performance of applications executing on them; this in turn, can cause the service quality to deteriorate. Focusing on application performance metrics alone will not necessarily lead to the source of the problem, and for complete confidence the underlying operating system must also be monitored 24 x 7. 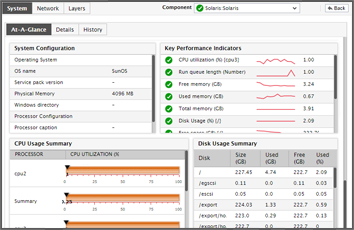 The eG Enterprise suite includes 100% web-based Solaris performance monitoring solution for Solaris servers. Besides measuring the overall operating system health, these models also periodically check: the availability of the host and any critical processes and services, resource contention, I/O activity, network traffic, and network latency. 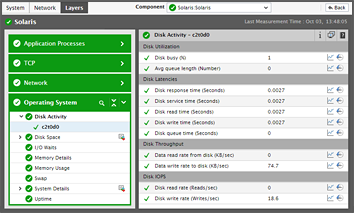 Performance monitoring of the Solaris hardware is also included in eG Enterprise. The Solaris operating system is known for its scalability and is commonplace in many large server farms. As a result, many business-critical services are configured to use applications executing on Solaris-based servers. The continuous availability of these end-user services depends upon the error-free functioning of the Solaris servers and the applications deployed on them. For round-the-clock Solaris monitoring and to proactively alert administrators to potential performance bottlenecks, eG Enterprise provides a dedicated Solaris performance monitoring model for servers. Inspired by the traditional OSI model, this representation of Solaris servers is composed of a set of hierarchical layers derived from the Solaris architecture. These layers are arranged hierarchically with upper layers depending on the performance of lower layers. Each layer in turn is mapped to a variety of tests, which report a critical metrics related to the Solaris server. You can have this easy-to-use model up and running in no time, as it only requires that a single eG agent be installed on each Solaris server that has to be monitored. An agentless monitoring option is also available, where a single agent on a Windows system can be configured to monitor any number of remote Solaris servers via SSH/Rexec. The agent uses secure mechanisms to extract critical statistics from the target Solaris systems. A wide variety of metrics related to resource usage, network health, TCP retransmissions, and availability of critical Solaris processes is reported, plus extensive hardware metrics. The values of each metric are compared against pre-defined thresholds set by the administrator, or against automatically computed norms determined by eG Enterprise based on past performance. Any deviations are alerted proactively to administrators, thus enabling administrators to initiate corrective actions quickly. In addition, the eG Enterprise intelligent correlation engine automatically performs correlation of the metrics extracted by each of the layers, and accurately isolates the problem source. Is the server hardware working properly? Which disk partition on the server is being actively used? Is load balanced across all the disk partitions, or are too many requests pending on any partition? Are disk partitions able to swiftly process all read and write requests? Is any partition experiencing an I/O bottleneck? Is any disk partition running out of space? Which processor is utilizing CPU resources excessively? Are any CPU-intensive processes executing on this host? If so, what are they? Is swap memory usage optimal? Does the host have adequate free memory, or is memory being paged out frequently? Did the system reboot as per schedule? Has any of the systems been running without a reboot for an unusually long time? What is the server load in terms of TCP connections to and from the server? At what rate is the page daemon scanning memory pages? Does the rate suggest a memory shortage? How many processes are currently running on the system? What is their current state? Are any of these processes using CPU / memory resources excessively? Have the inode and buffer caches been used effectively? Is any network interface using bandwidth excessively? Which one is it? Is the quality of the network connection to the host good, or are too many packets getting lost in transit? Are users able to connect to the host quickly via the network link? Is any processor supported by the host currently unavailable for use? Are all disk and memory partitions on the host available? Is the fan available and being used? Is the power supply unit available for use? Have too many system faults occurred? Were any sudden spikes in temperature detected? Internal and external perspectives: A single agent on the Solaris server, or a single remote agent, is capable of monitoring the internal health of the server and its network health. Flexible monitoring options: Choose between agentless and agent-based Solaris performance monitoring approaches on a per server basis. This ensures that while some serves can be managed in an agentless manner, others can be managed in an agent-based manner. Automatic top-down correlation: eG Enterprise uses a patented correlation algorithm that correlates the performance across layers, and assigns the highest priority to the layer that serves as the root-cause of problems in the host. This way, system administrators can focus on the source of a problem, and not be distracted by the effects. Intelligent thresholding: The automatic thresholding capability of eG Enterprise ensures that the thresholds vary dynamically based on normal usage patterns. This way, problems are identified before they affect service and false alerts are reduced. Single-pane-of-glass solution: eG Enterprise provides actionable answers for performance bottlenecks anywhere across the infrastructure, allowing administrators to focus effort on solving problems instead of locating them.